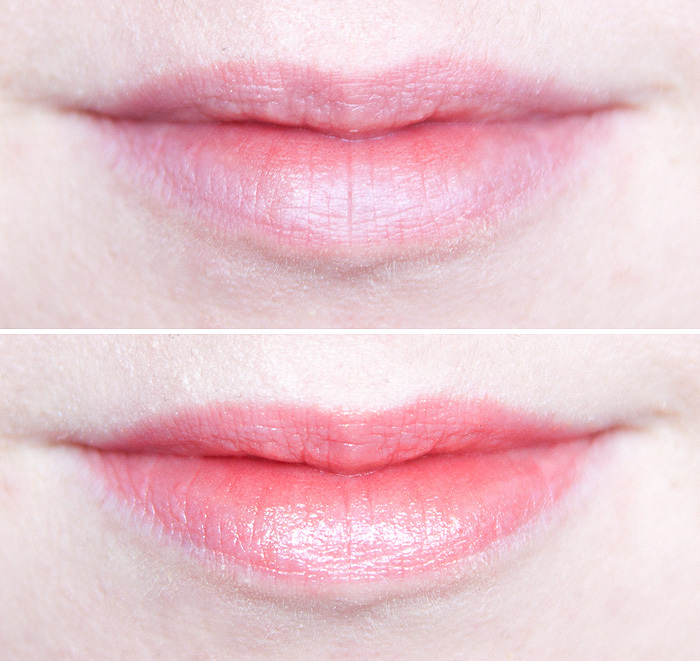 If you’re a fan of sheer formulas that give a hint of colour without the commitment of something too bold, you’ll probably already be aware of the Clinique Chubby Stick formula which achieves just this. I like my lip colour to be a little more in your face, Stace! but I can appreciate that those of you wusses who still rely on stabilizers will probably come over all unecessary over the new shades. 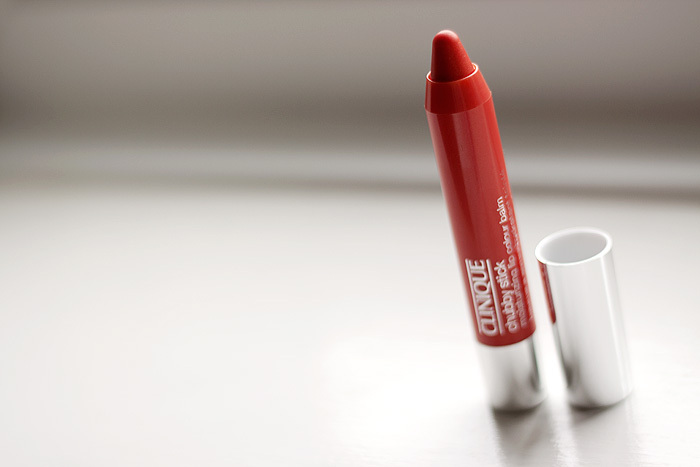 I’ve got one here called Oversized Orange (sounds like me after I’ve fake tanned) and it’s actually a pretty nice way to wear a shade that I usually run away from. It glides on smoothly and despite my attempts at laying it on an inch thick to build colour (old habits die hard), it builds pigmentation only moderately but impressively doesn’t go all claggy or yukky on the lips. It feels moisturising enough and isn’t remotely sticky. It doesn’t look like it’s made much difference at all in the lip swatch (which is why I always advocate full face shots when it comes to lipsticks! )… because, it actually packs enough colour to finish and polish a look. At least, on my fairly unpigmented lips. 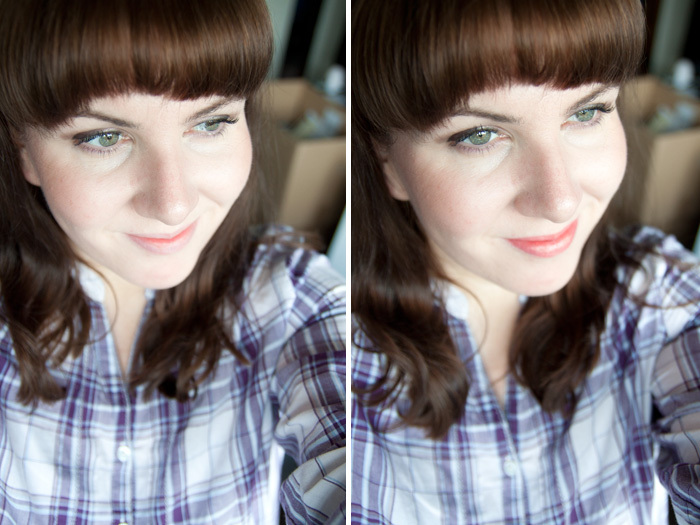 Please excuse the fringe, I struggled badly at flattening my cow-lick today! 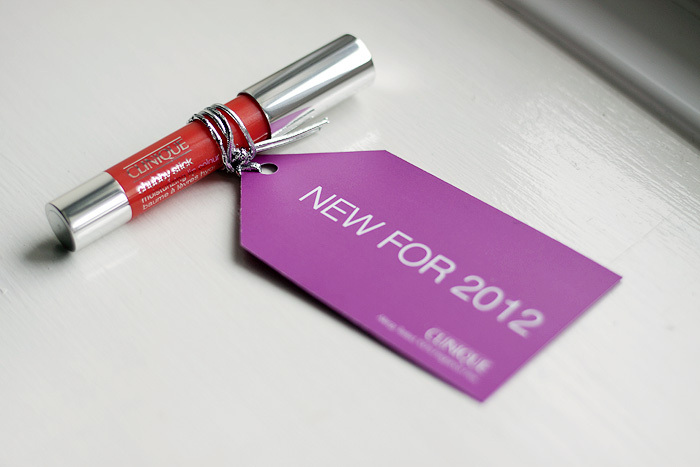 Clinique Chubby Sticks are available to buy on counter and online, priced at £16 each. The eight new shades (including Oversized Orange will be available from June). Do you own any Clinique Chubby Sticks? Like a sheerer, more balmy lipstick? I had to google it to make sure it wasn’t a “cat-lick” or some word that I’d made up based on something I thought I’d heard a billion years ago! Right, off to Boots on the weekend for this one! (See what I mean about your blog draining my bank account?!) What colour do you recommend for a natural colour lip? Don’t do ‘colours’, need something that doesn’t shout at you. Oh god, these are the first time I’ve seen this in action and they’re a bit bleh aren’t they. I was expecting an Eyeko type chubby that gives a huge bang of color with a quick swipe when I saw the first picture. Know there’s been loads of fuss and hype about them but they’re not what I was expecting at all so no desire to lem, yay! These are my makeup staples! I LOVE Clinique Chubby Sticks, and am so excited for the new shades to come out 😀 I have mine in Chunky Cherry, and it’s the one and only red I can actually pull off. It is great, because you are so right when you said how these can pull together a look. How can you not love a lip balm with amazing colour, and that goes on so smooth and feels great on the lips. No, you CAN pull off a brighter red, I refuse to believe you can’t! (unless you are infact Ronald McDonald). You just haven’t found it yet! I have a cowlick in the left of my fringe. It.drives.me.mad. The only way I can really get it to bog off (the cow lick) is to blow dry horizontally from one direction, then cross my fringe across the parting and blow dry from the other direction. At no point must I place the round brush UNDER my fringe and blow-dry, or else it’s game over, hello fringe pouf in just one really obvious place! That looks like a nice colour. Really though, I’m more impressed at how extremely pretty and flattering your newly lighter shade of hair is. Very nice. And brave. I’d be terrified to lighten my hair. Thanks Krystal, I was/am! I’ve boguht another box dye though for next time (even though I know I shouldn’t) and it’s proper red, as in pale auburn, red. To think I’ve spent all these bloody years trying to kill the red tones!